Paul Pi presents intelligent modes of thinking about the world, discussing deeply the common threads between various religions, sciences, and philosophies. Paul Pi skips stones across the vast waters of religious and scientific thought in his ambitious first book, Trinitarian Wisdom - The Art of Life. Touching on topics from Hinduism to quantum mechanics, Pi presents an expansive challenge to conventional modes of thinking about how life works. Some of his cast stones travel far into the distance, some dive deep, and others just touch the surface, but Pi follows the path of each in his wide-ranging survey of paradigm-shifting thought. Pi’s extensive studies have led him to develop a new model for living the ideal life—the Trinitarian Principle—which he enthusiastically explores in these densely packed pages. Pi’s stated thesis is that there is a “commonly shared core value among all domains, especially the ones of philosophy, science and religion,” that can be explained “by means of the trinitarian wisdom.” Pi examines this concept by calling into question the very way we perceive the world, looking for common threads in the work of philosophers, storytellers, scientists, and religious leaders throughout history. It’s complex reading, and Pi warns up front that the material will be very challenging. He calls on readers to put aside conventional, linear thought and instead don new “3-D glasses” to experience all of the dimensions of time and space. The content of this book is certainly challenging, as Pi covers such complex topics as Einstein’s theory of relativity and Zeno’s paradoxes in thirty dense chapters. Accompanying illustrations, diagrams, quotations, and stories shed intriguing yet limited light on ideas that scholars spend lifetimes studying. There’s simply not enough room here to adequately examine the origins of all of the world’s religions, which is just one of Pi’s topics. Each chapter could easily be the basis of a college seminar, or even a PhD dissertation. Although appendices further address Islamic, Hindu, Buddhist, and Taoist religions, a complete reference list would be a welcome addition. Pi’s presentation style also offers a challenge, as he frequently employs double negative language—“not head/not not head” or “not tail/not not tail” to describe a coin toss, for instance—that requires absolute attention if one is to comprehend his message. Other passages are not logical in the usual sense—“The seemingly nothingness of absolute is, in fact, the ultimate source of somethingness as well as the whole lot”—but serve a role similar to Zen koans: they make us confront an apparently unresolvable paradox and thus require a whole new way of thinking. All of the thought experiments can be overwhelming, making it easy to lose track of Pi’s overarching goal, which is to define his conception of trinitarian wisdom. He never sums it up in one neat definition but instead ends the book by recommending several personal practices, like meditation and energy medicine, that readers can use to bring them closer to realizing his integrative ideal. 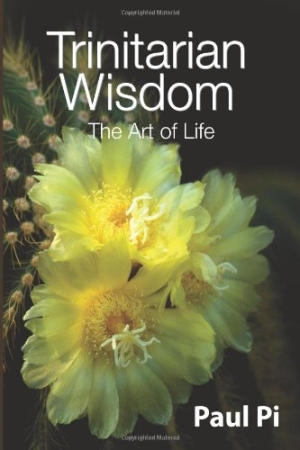 Unlike the simple cactus flower that blooms on its cover, Trinitarian Wisdom is not a light read. It would be most appropriate for a study group with lots of room for discussion, or as the foundation for an unconventional, college-level philosophy course.